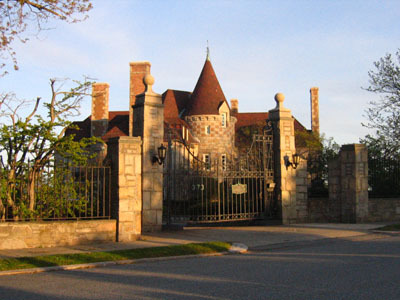 Here is a castle that my wife and I found while driving through Marblehead Neck, Massachusetts. It's located on Ocean Avenue. From what we know, it was built in 1929 and is called Carcassone. I'm assuming that's it's either modeled after or inspired by a castle in Carcassone, France. It appears to be a private home. It's absolutely beautiful. 1935 -- Carcassonne Castle is built on the Neck by Lydia Pinkham Gove, the grandaughter of Lydia Pickham, at a cost of $500,000. She named the structure, "Sky High." After her death in 1948, the castle sold for $50,000. The Town briefly considered the structure for a hospital, but the idea was discarded at Town Meeting. Thanks to Rick Atkin for sending the photo.